سالاری, مرضیه, احمدی گیوی, فرهنگ, معماریان, محمدحسین. (1393). بررسی امواج کوهستان با استفاده از یک مدل تحلیلی دوبُعدی. 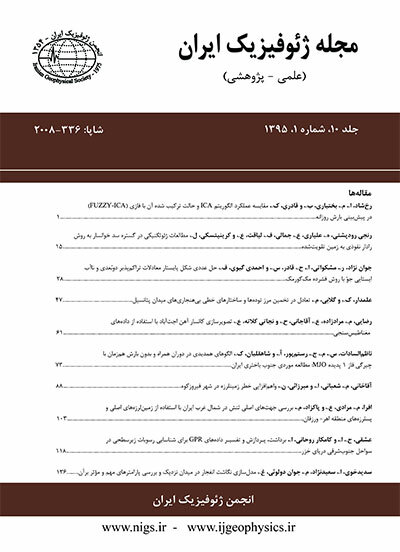 مجله ژئوفیزیک ایران, 8(2), 123-139. مرضیه سالاری; فرهنگ احمدی گیوی; محمدحسین معماریان. "بررسی امواج کوهستان با استفاده از یک مدل تحلیلی دوبُعدی". مجله ژئوفیزیک ایران, 8, 2, 1393, 123-139. سالاری, مرضیه, احمدی گیوی, فرهنگ, معماریان, محمدحسین. (1393). 'بررسی امواج کوهستان با استفاده از یک مدل تحلیلی دوبُعدی', مجله ژئوفیزیک ایران, 8(2), pp. 123-139. سالاری, مرضیه, احمدی گیوی, فرهنگ, معماریان, محمدحسین. بررسی امواج کوهستان با استفاده از یک مدل تحلیلی دوبُعدی. مجله ژئوفیزیک ایران, 1393; 8(2): 123-139. جریان هوا روی کوه از پارامتر‌های گوناگون از جمله ارتفاع کوه، سرعت باد، شکل کوه و عوامل متعدد دیگر تاثیر می‌پذیرد. در این مقاله، با استفاده از یک مدل تحلیلی دوبُعدی میان‌مقیاس غیرخطی، شارش‌های جوّی روی کوه و پشت به باد آن بررسی شده است. در این راستا، با در نظر گرفتن تقریب بوسینسک و صرف‌نظر از نیروهای کوریولیس و اصطکاک و همچنین فرض ثابت بودن گرادیان دما و سرعت باد آستانه با ارتفاع، دستگاه معادلات به معادله هلمهولتز تبدیل شده و با استفاده از معادلات بسل مرتبه اول و دوم حل می‌شود. مدل برای حالت‌های ترکیبی گوناگون شامل یک و دو قله منفرد زنگی‌شکل با تغییر در پهنای کوه، ارتفاع و پارامتر لیرا و با استفاده از داده‌های تحلیلی که دامنه تغییرات عدد بدون بعد «فرود» در مورد آن مد‌‌نظر قرار گرفته، اجرا شده است. نتایج نشان می‌دهد که افزایش تعداد قله و ارتفاع کوه، کاهش پهنا و پارامتر‌ لیرا، تأثیر محسوسی بر تغییر مؤلفه قائم و افقی باد در پشت به باد کوه دارد. در بین پارامتر‌های فوق، تأثیر ارتفاع کوه بر امواج کوهستان و مؤلفه‌های سرعت باد بیشتر است. به‌علاوه، در مورد دو قله منفرد نیز بعد از قله دوم، خطوط جریان تقویت شده و مؤلفه قائم سرعت افزایش می‌یابد. Mountain waves are formed on the leeward side when a uniform and steady air flow impinges a mountain. Unstable air and severe winds on the leeward side are hazardous to the flight of aircrafts, change the distribution of aerosols, and cause damage to agricultural products. The purpose of this study is to examine the air flow over the entire mountain region using a two-dimensional analytical meso-scale model. The model was run for various conditions by changing one of the main factors or the number of mountain ridges. These factors included Lyra parameter (lc=2p U/N, where the initial state zonal flow U and buoyancy frequency N are both assumed to be constant), Froude number (Fr=lc/2phm, where hmis the amplitude of the mountain ridge), height and width of mountains. For simplicity, we made many assumptions. The initial air flow on the windward side was assumed to be stable, steady and frictionless with no rotation. Also, the horizontal temperature gradient and thereby the vertical wind shear for maintaining a thermal wind balance are constant. These conditions cause the non-linear equations to become linear. By running the model, the Helmholtz equation is solved using the first and second Bessel equations and the horizontal wind which impacts the mountain nearly at a right angle is transformed to the Lyra parameter. Our results showed that all the factors mentioned above could substantially affect the characteristics of the air flow over the mountain ridge as well as at the leeward side. In this regard, streamlines as well as the horizontal and vertical components of the wind were investigated. For fixed height and width of a single mountain, the maximum amplitude of the streamlines and thereby the maximum upward motions were weakened by increasing the Lyra parameter, whereas there was no specific change in the horizontal component of the wind. Alternatively, for a fixed mountain height and the Lyra parameter, the maximum amplitude of the streamlines and the maximum horizontal wind were increased in the wide mountain ridge compared to the narrow one. Since streamlines tilted toward the west with height in the leeward side, the maximum upward motions were decreased somewhat. In the next experiment, for a fixed mountain width and the Lyra parameter, all the characteristics of the air flow in the leeward side (the maximum amplitude of streamlines and the maximum values of horizontal and vertical components of wind) were intensified largely when the mountain height was increased. In general, the effect of the mountain height on the characteristics of the air flow impinging a mountain is the dominant one among the other factors. It can be mainly due to the increase of streamline gradient in the windward side of the mountain. Extremely large surface and upper-level winds (horizontal and vertical components) were seen in all the experiments. This is because the friction term has been neglected in the equations. In the real atmosphere, friction would moderate these winds quickly. Now consider a mountain associated with two ridges having equal heights. It is observed that the existence of the second ridge leads to more intensification of the horizontal and vertical components of the wind in the leeward side of the second ridge. Also, the lee cyclones produced by the wide ridges, especially over the second ridge, were more intense than those by the narrow ridges. The other noticeable point was that the more westward vertical tilt of streamlines in the wide ridges were associated with smaller vertical motions, compared to the narrow ridges. This is because the vertical gradient of streamlines for the narrow ridges is much more than in the wide ridges. But generally, the upward and downward motions became maxima in the downstream and upstream sides of the troughs, respectively. احمدی گیوی، ف. و نجیبی‌فر، ی.، 1383، مطالعه چرخندزایی در پشت به باد کوه‌های آلپ و اثر آن بر آب و هوای خاورمیانه برای دوره یک ساله: فیزیک زمین و فضا، 30(2)، 19 – 1. سالاری، م.، احمدی گیوی، ف. و معماریان، م. ح.، 1389، بررسی تاثیر امواج کوهستان بر سرعت افقی باد با استفاده از یک مدل تحلیلی دوبُعدی: چهاردهمین کنفرانس ژئوفیزیک ایران، مؤسسه ژئوفیزیک دانشگاه تهران، 21-23 اردیبهشت 1389. علی‌اکبری بیدختی، ع. ع.، 1383، مبانی دینامیک شاره‌ها: مؤسسه انتشارات و چاپ دانشگاه تهران- ایران. علیزاده، ا.، آزادی، م. و علی اکبری بیدختی، ع. ع.، 1387، بررسی نقش رشته‌کوه‌‌ البرز در تقویت سامانه‌های همدیدی: فیزیک زمین و فضا، 34(1)، 24 – 9. مرادی، م.، مشکواتی، ا. ح.، آزادی، م. و علی‌‌اکبری بیدختی، ع. ع.، 1386، بررسی تحلیلی شارش هوای روی کوهستان: فیزیک زمین و فضا، 33(1)، 155- 135. معماریان، م. ح.، احمدی گیوی، ف. و سالاری، م.، 1388، بررسی امواج کوهستان ناشی از شارش‌های جوّی با استفاده از یک مدل تحلیلی دوبُعدی: هشتمین همایش پیش‌بینی عددی وضع هوا، پژوهشکده هواشناسی تهران، 90 -81. Farahani, M. M. and Wu, R., 2003, Mountain drag and adjustment to equilibrium: A numerical study: J. of the Earth and Space Physics., 29, 1-12. Gill, A. E., 1982, Atmospheric – Ocean Dynamics. Academic Press, 666 pp. Hayes, J. L., Williams, R.T., and Rennick, M. A., 1993, Lee cyclogenesis, Part II: Numerical studies: J. Atmos. Sci., 50, 2354-2368. Holton, J. R., 2004, An Introduction to Dynamic Meteorology: Elsevier, Academic Press, 553pp. Klemp, J. B., and Lilly, D. K., 1978, Numerical simulation of hydrostatic mountain waves: J. Atmos. Sci., 3, 78-107. Kozhevnikov, V. N., 1963, One nonlinear problem of orographic disturbance of a stratified airflow: lzv. AN SSSR, Ser. Geophys., 7, 1108-1116. Kozhevnikov, V. N., 1968, Orographic disturbances in two-dimensional stationary problem: Bull, Izv. Akad. Nauk SSSR, (1), 4. Kozhevnikov, V. N., 1999, Disturbances of the Atmospheric Overflow above the Mountains: Mir, Moscow, 200 pp. Kozhevnikov, V. N., and M. H. Memarian, 2006, Orographical disturbances and flights safety problems over mountains in Iran: (in Russian), Issues of risk analysis, 3, 346-361. Long, R. R., 1953, Some aspects of stratified fluids. 1. A theoretical investigation: Tellus, 5, 42-58. Lyra, G., 1943, Theorie der stationaren Leewellenstromung in freier Atmosphere: Angew. Math. Mech., 23, 1-28. Memarian, L. R., Kozhevnikov., M. H., and Dmitriev-Arrago, V. N., 2009, Waves clouds over mountains: Russian Meteorology and Hydrology, 34, 604-612. Queney, P., 1948, The problem of air flow over mountains: A summary of theoretical studies: B. Am. Meteorol. Soc. 29, 16-26. Teixeira, M. A. C., M. A. Miranda., and J.L. Argain, 2008, Mountain waves in two-layer sheared flows: Critical-level effects, wave reflection, and drag enhancement: J. Atmos. Sci., 65, 1912-1926.